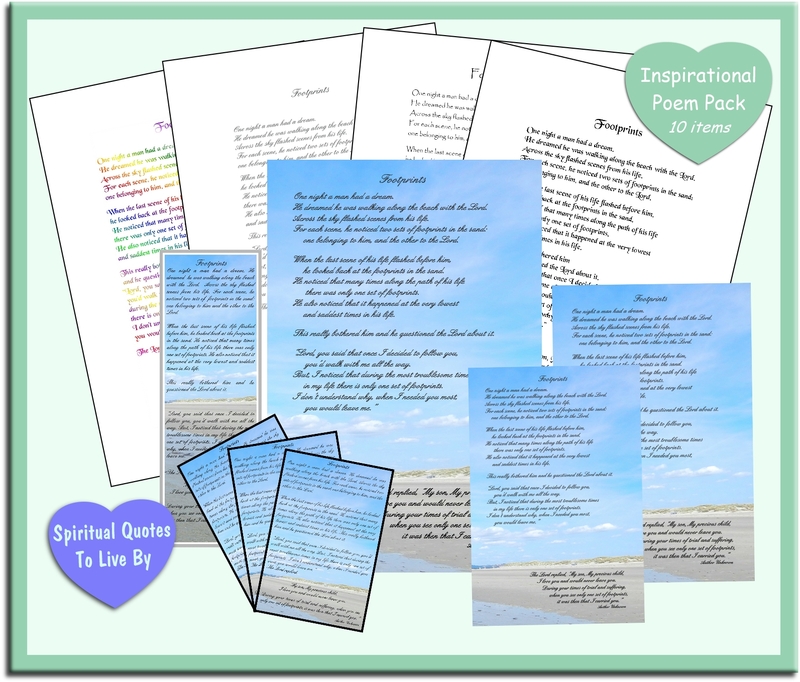 These Inspirational poems and stories are all positive words of wisdom to uplift your spirit and give guidance to living a life of love, peace and happiness. 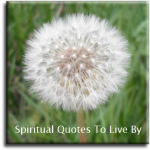 Everything on this page is from unknown sources, for known people please take a look at Spiritual Inspiration Poems. 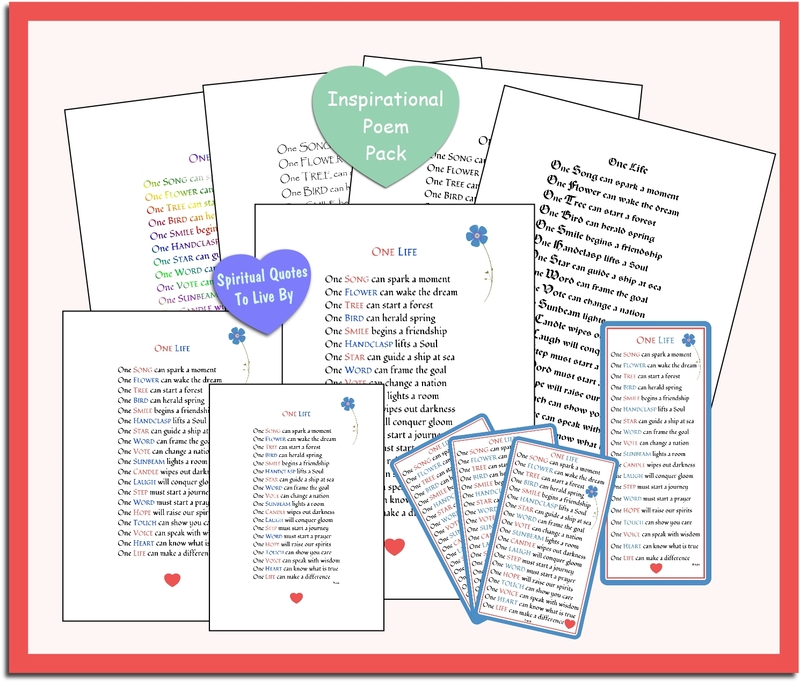 There are also several poems and readings of love on the Wedding Quotes and Wedding Sayings pages. One night a man had a dream. He dreamed he was walking along the beach with the Lord. Across the sky flashed scenes from his life. For each scene, he noticed two sets of footprints in the sand: one belonging to him, and the other to the Lord. When the last scene of his life flashed before him, he looked back at the footprints in the sand. He noticed that many times along the path of this life there was only one set of footprints. He also noticed that it happened at the very lowest and saddest times in his life. This really bothered him and he questioned the Lord about it, "Lord, you said that once I decided to follow you, you'd walk with me all the way. But I noticed that during the most troublesome times in my life there is only one set of footprints. I don't understand why when I needed you most you would leave me." The Lord replied, "My precious, precious child, I love you and I would never leave you. During your times of trial and suffering, when you see only one set of footprints, it was then that I carried you." To be satisfied with your possessions, but not contented with yourself until you have made the best of them. To despise nothing in the world except falsehood, and meanness, and to fear nothing except cowardice. To be governed by your admirations rather than your disgusts. To covet nothing that is your neighbour’s, except his kindness of heart and gentleness of manners. To thing seldom of your enemies, often of your friends, and every day of Christ. And to spend as much time as you can, with body and with spirit, in God’s out-of-doors. These are the little guideposts on the way to peace. A meeting was held quite far from Earth. "It's time again for another birth"
Is Heaven's very special child"
I BELIEVE in the deep blue sky and the smiling water. I can see through the clouds of the sky and I am not afraid of the waves of the sea. I BELIEVE in the living friendship given by flowers and trees; outwardly they die, but in the heart they live forever. Little paths through green woods I love, and the sound of leaves on the ground, or of a nut falling, or even of a broken twig. I BELIEVE that the days to come already feel the wonder of the days that have passed, and will permit the wonder to endure and increase. I BELIEVE in, and love my belief in, and my love for, all of these things; and most of all, I believe in and love The Source of my belief, and of my love. 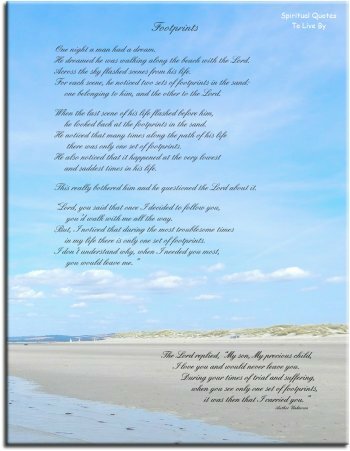 The poem that begins - If you think you are beaten, you are - was written by Walter D. Wintle so has now moved to the Inspirational Poems from known sources page. How shall I ever be in doubt? An old man walking along a beach at dawn noticed a young man ahead of him picking up starfish and flinging them into the sea. Catching up with the youth he asked what he was doing. "The starfish will die if they are still on the beach when the sun roasts them with its mid-morning heat," came the answer. "But the beach goes on for miles, and there are millions of starfish," countered the old man. "How can your effort make any difference?" The young man looked at the starfish in his hand and threw it safely in the waves. "It makes a difference to this one," he said. Of a friend till he is dead? Lack the joy you may impart? The strength of ‘two or three’ in prayer? Falter for a word of cheer? Would ever be an oak? You see," he said, "I'm blind"
then I said, "Why don't you join the others, dear?"